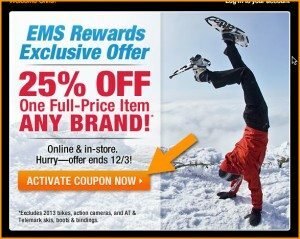 Here’s Eastern Mountain Sports shaking up the email marketing world a bit with a nice Call to Action: “Activate Coupon Now”. There’s urgency — but not an absolute implied commitment. Interesting mix. EMS, what’s your click through on this?